Getting young men to join the armed forces was the goal of many World War 1 propagand posters. Fresh recuits were needed to replace the staggering losses suffered by both sides during the murderous battles of World War 1. 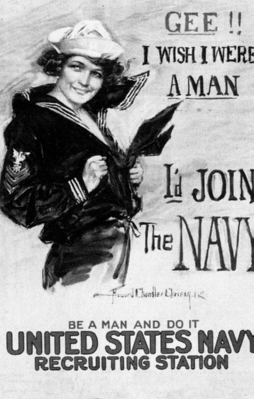 Recruiting posters appealed to the recruits sense of duty and patriotism; and, as in the case of the poster below, they equated joining the fight, with being a man. The poster reads "Gee!! I Wish I Were A man / I'd Join the Navy / Be a Man and Do it/ United States Navy Recruiting Station." 1917. Color poster by Howard Chandler Christy. Issued by Navy Publicity Bureau. A British recruiting poster. 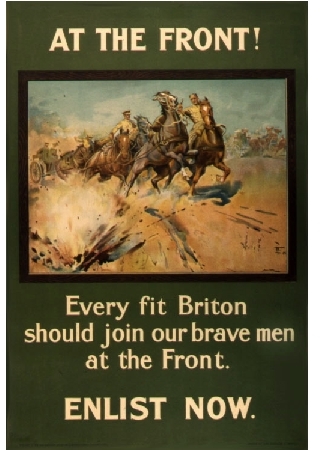 The message reads: Every fit Briton should join our Brave Men at the Front. Enlist now. 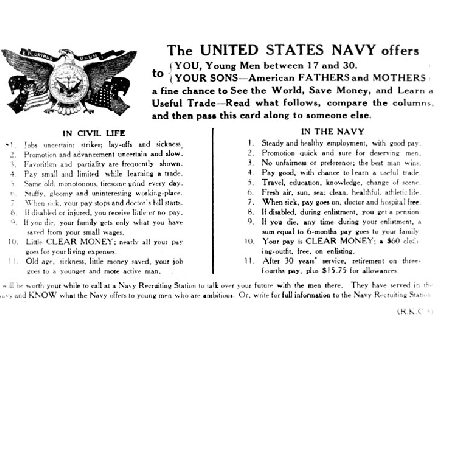 An American poster encouraging men to join the navy by comparing the benefits of navy life to civilian life. Benefits included good pay, health benefits, a change of scene and healthy, athletic life versus poor pay, poor job prospects and monotonous life as a civilian.